This page on Foxes is not designed to give information on how to care for them or how to look after them, (this information can be found on other websites) but to try and show the other side of the Fox. 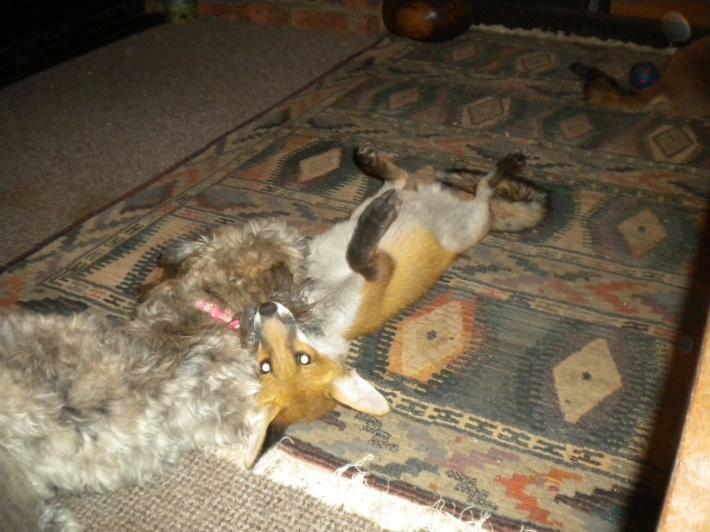 The Fox is one of our most misunderstood animals in the UK. We have reared several cubs and taken in many sick & injured adult foxes and they are NOT the vicious killing machine that some people believe them to be. An adult cat or dog is more than a match for a fox and as for attacking people, it would be as the last line in its defence, say if cornered, but even then it wouldn't bite and hold, merely snap. An adult male weighs in at a mere 7kg with the female at just 5kg. Your average pet cat weighs more than this, and the average dog is much heavier. 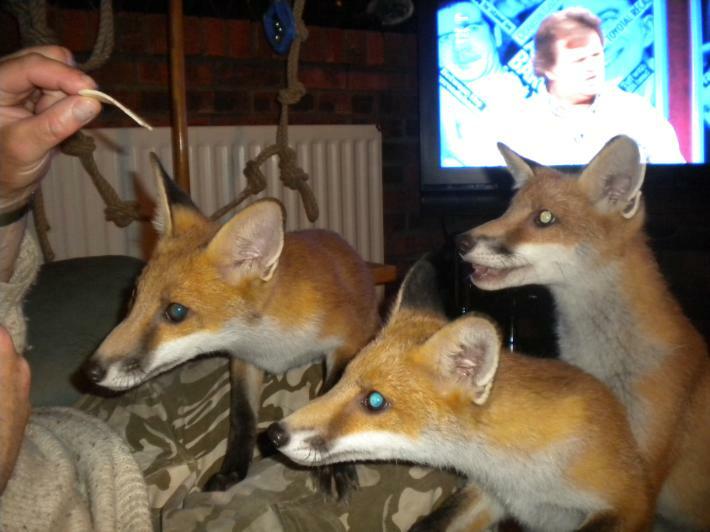 Picture below is 3 cubs bored with the TV as soon as they smelt some cheese! 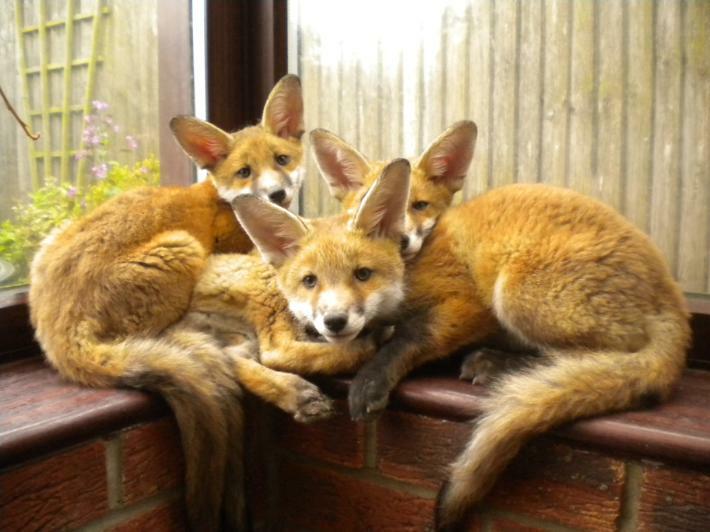 It annoys us just how many people phone us up and say something like........We have got a family of foxes under our shed/decking etc, can you come and re-locate them back into the countryside. I'm sorry but we will not do this. They have chosen to live where they are and made it their home. They will not attack you or your children or your cat or dog. Its more likely that the fox or cubs be hurt by a large dog or by humans. Picture below shows a cub playing with Roxy our 18 month old Lhasa-apso. The picture below is 2 naughty cubs saying Mess? What mess? 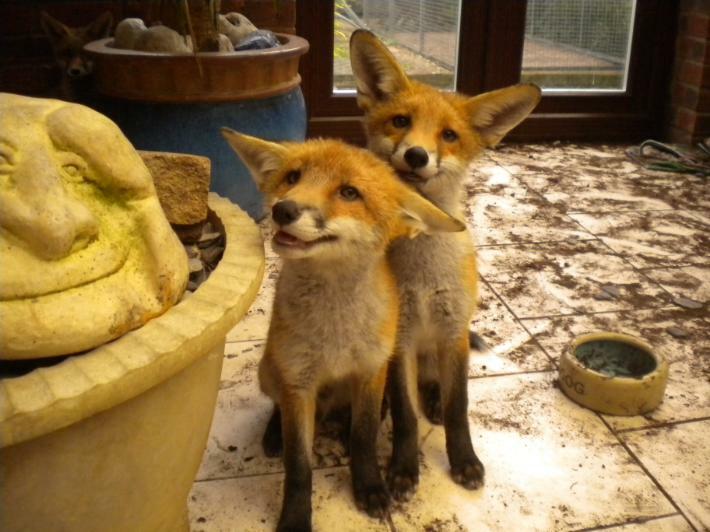 We turn our backs for 5 minutes and find them digging in a plant pot. This page is still in the making and when time allows will update. Hope you like the pictures. This is Tonia with Barny our almost totally blind Fox cub who is being brought up as a pet as would never survive in the wild.